Temporarily relieves nasal congestion due to the common cold, hay fever or other upper respiratory allergies. AllegroMedical.com presents The Sunmark Maximum Strength Non Drowsy Nasal Decongestant PE. 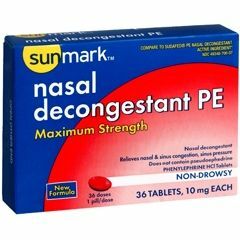 sunmark Nasal Decongestant PE Tablets. 10 mg. Temporarily relieves sinus congestion and pressure. Temporarily relieves nasal congestion due to the common cold, hay fever or other upper respiratory allergies. Non-drowsy. Not made with natural rubber latex. Packaged: 36 Per Box.